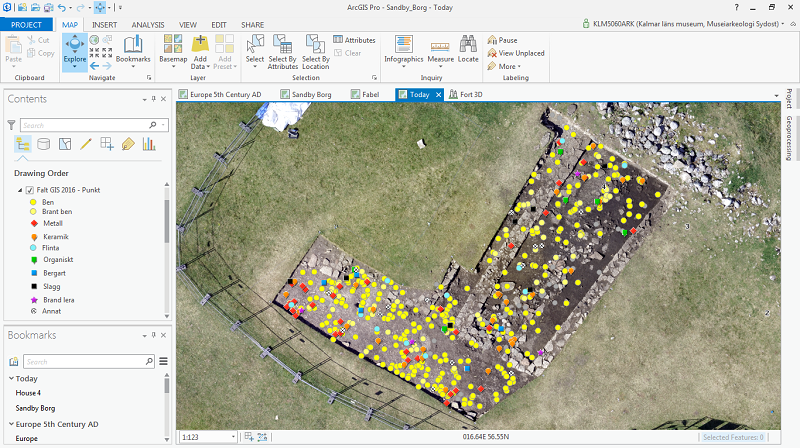 The Museum’s team flew a drone over the site to collect aerial images and processed the data using Drone2Map for ArcGIS and created a high resolution basemap and elevation surface, all in just one day. This new basemap allowed the archaeologists to see traces of house foundations within the fort. Raster functions and image classification techniques further enhanced the building foundations and delineated the fort’s ring wall and defensive boulders just outside the wall. Next, archaeologists excavated one of the dwellings–house 40. 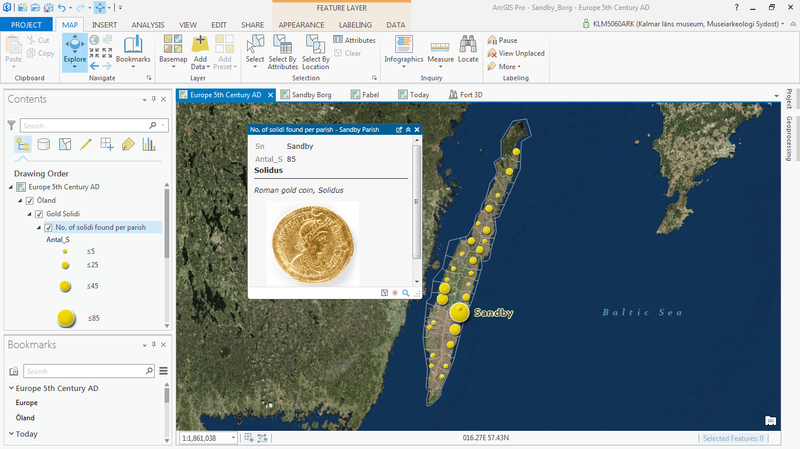 They document the artifacts using a workflow developed by the Museum called IDA, Instant field Documentation system and Availability, which utilizes Collector for ArcGIS. “Thanks to Collector we have more efficient data collection, a user friendly interface and high accuracy measurements when combined with the Leica Zeno 20”, said Nilsson. In house 40 they found food remains – a pile of lamb bones and fish skeletons. It would seem the fort was suddenly deserted, leaving meals unfinished. To their surprise, the archaeologist also found evidence of a mysterious and violent event; they uncovered 6 complete human skeletons. Their osteologist (bone expert) determined that all of them died a violent death, some suffered fatal blows to the head. In order to unravel the mystery of who they were and what happened to them, the archaeologists needed to find more skeletons in order to perform osteology and DNA analysis. So they called on the amazing Fabel. Fabel, a black German Shepherd, is trained to find human skeletons, even ones that are 1,500 years old. With a Zeno 20 loaded with Collector for ArcGIS strapped to his back, Fabel sniffs out bones. His handler then tags the spot with a flag as well as hitting a button on the device to digitally mark the spot. While Fabel was not available to attend the Esri User Conference due to his work commitments, the Esri team was able to recognize Fabel as the only certified Arkeologihunden (archaeology dog) making a difference with GIS. 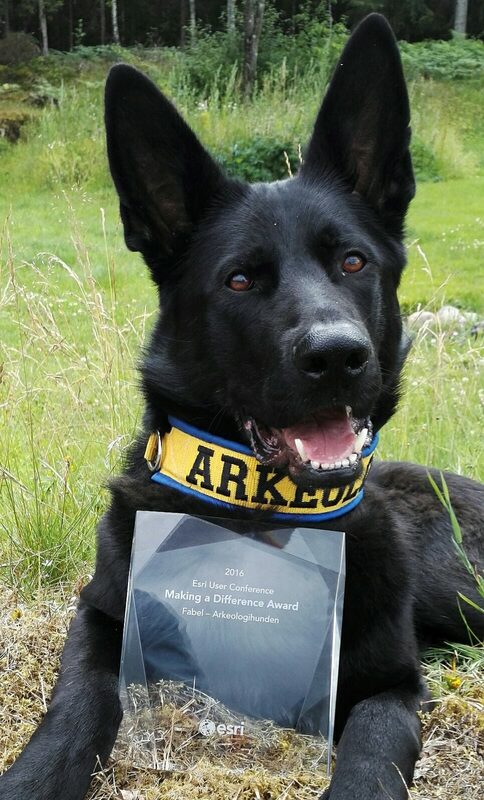 Fabel the canine Archaeologist shows off the Making a Difference award. Today the team is excavating house 4. They’ve collected over 500 finds and every day they fly the drone to document their dig. Using ArcGIS 3D capabilities, the team digitally reconstructed the fort including the houses, grass roofs, and defensive wall. 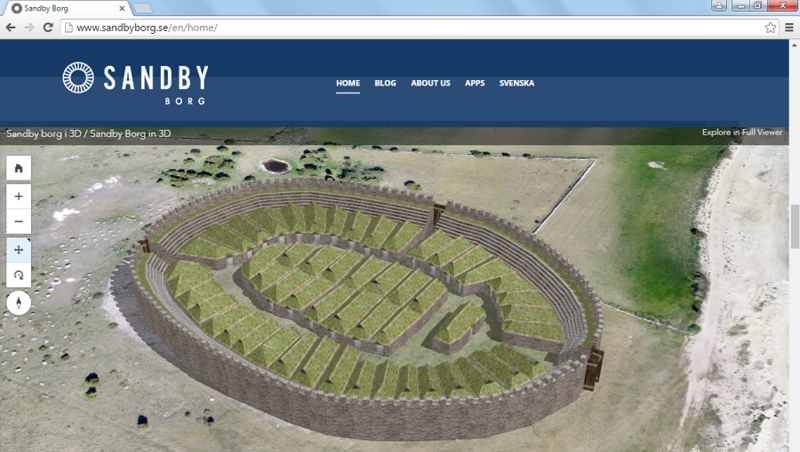 Kalmar County Museum has embedded web maps and a 3D web scene on the Sandby Borg website (http://www.sandbyborg.se/ in Swedish and http://www.sandbyborg.se/en/home/ in English) so that visitors can interactively explore the site and follow the project as it advances. 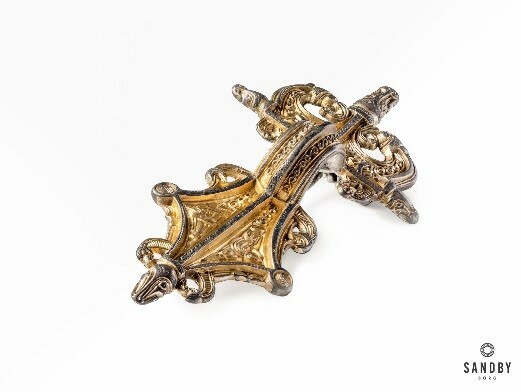 What the archaeologists found through several years of excavations is that around 480 AD Sandby Borg was the site of a massacre so terrifying, that the fort became taboo; no one ever returned; the bodies were never buried; the houses never looted; the farm animals never stolen or released; and the site was never rebuilt upon. These are the mysteries at Sandby Borg.